The entry is inspired in its holistic treatment of the landscape. This clearly shows, better than its competitors, how important it is to develop the entire waterfront area and river mouth as one zone connecting the two cities in terms of functions and the landscape. The shortest way from one city to the other is along the waterfront! In Haparanda, the existing leisure amenities speak to this type of development throughout the river mouth and in Tornio. The entry offers an angle that complements many of the other proposals. The urban design input of the proposal is very limited and here it falls short of the objectives of the competition. The presentation is evocative but sketchy and partly difficult to read. The E4 has been integrated into the urban fabric by means of landscape architecture and an overarching landscaped building which could be a visitor centre. The natural conditions such as flooding have been used as a design driver to come up with a distinctive design solution. 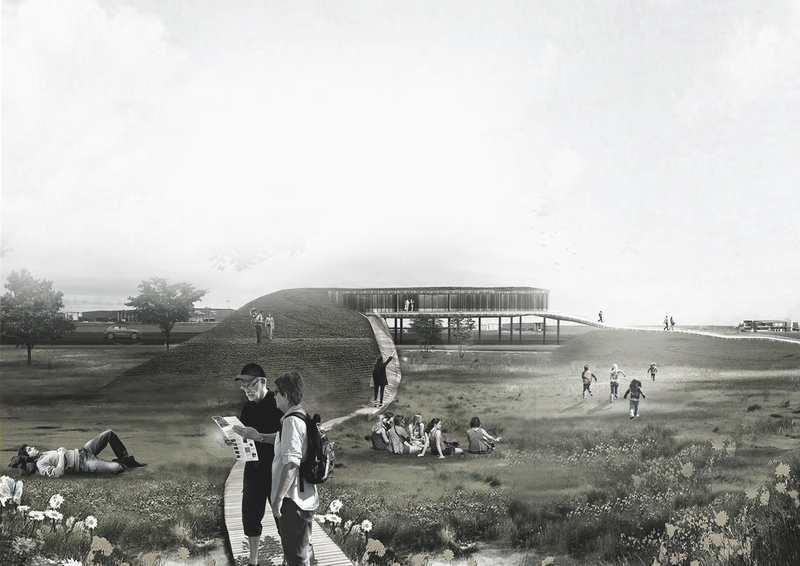 The main idea of the proposal – to bring visitors into the landscape park by means of a loop where they can experience the natural environment as it changes with seasons – is considered a viable way to enhance the site brand. 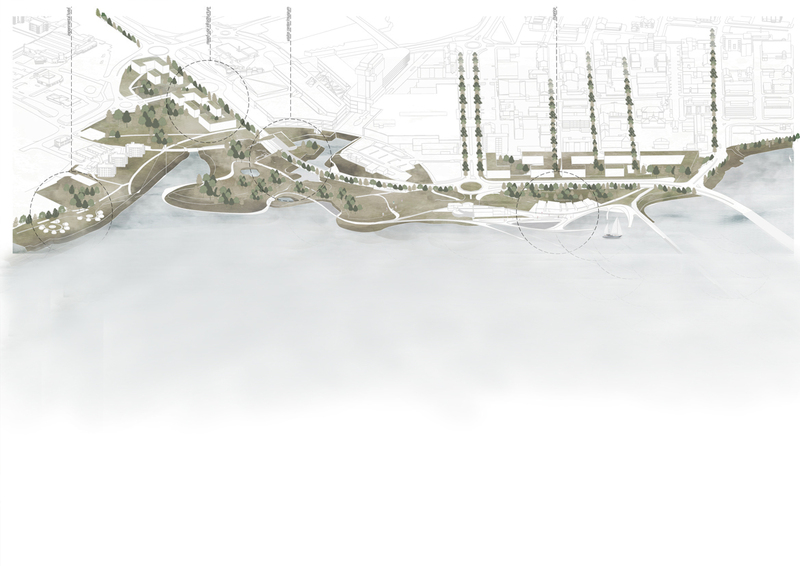 Our aim is to bring the two cities of Tornio and Haparanda towards their river edges. This will provide opportunity to redevelop the underutiliesed and empty plots near the waterfront areas to create new city districts and neighbourhoods, transforming the area into a lively urban zone. We identify the landscape and the use of greenery to act as tangible connectors between different areas. The diverse natural profile of TornioHaparanda combined with ample opportunities for utilising natural resources, make the region appealing for living and tourism. The landscape of the site is mostly open and buildings are sparse and scattered with grass areas between the spaces. A large portion of the open landscape in the center of the site has many building restrictions that apply due to the rising tide of the river. This results in temporally changing characteristics of the landscape during the springtime due to the higher water level. As a consequence of this we decided to harness these characteristics in order to create a park landscape that allows visitors to experience the beauty of this landscape as it changes through the days and seasons. This results in the creation of the loop: a system to provide visitors the possibility to pass through the various land types. 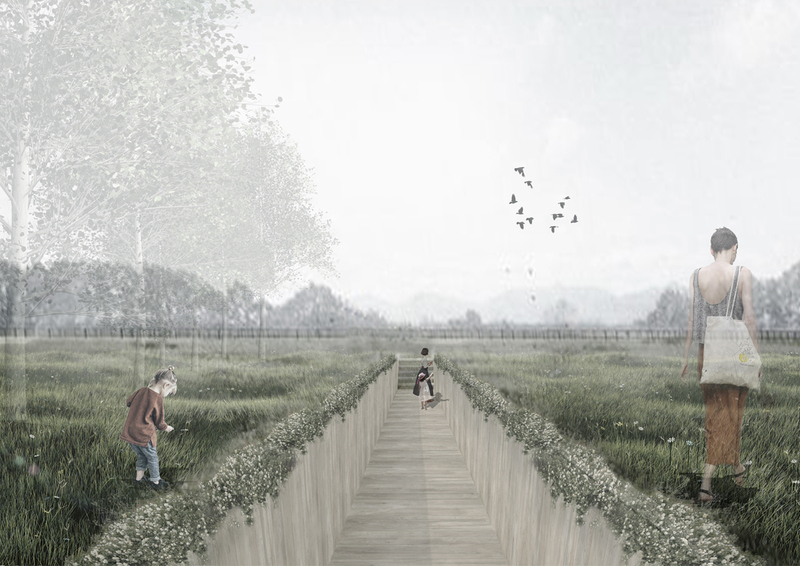 The project proposes a path structure for passage and relaxation that appeals to all senses and all seasons. Different points along the path awake different senses, gathering sceneries, textures, smells and different visual experiences, all harmoniously fading in and out along ones journey through the site. The interaction between man and nature changes as the loop meanders along the changing landscape where the flora and fauna also changes depending on its location within the landscape. At some points the loop structure is tangible and provided space for certain functions and at other places the loop fades away entirely, only defined by the surrounding flora. It operates as its own living organism, constantly changing from built structure to ceasing to exist completely, also depending on the seasonal changes. The urban project is split into 3 focal points: These the visitor center, located in the center between the two cities, the redevelopment of the harbour area, and the tourist accommodation in the form of an experiential hotel. These focal points are brought together and connected through the regeneration of the existing landscape that separates the areas.